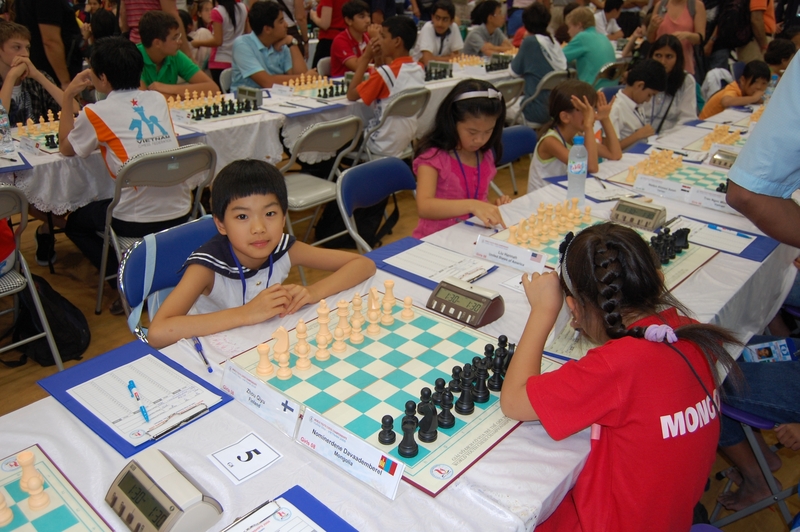 The first Jamaican International Chess Festival brought four strong youngsters to promote chess on the beautiful island of Jamaica: Awonder Liang, Akshat Chandra, Akshita Gorti and Qiyu Zhou — all up-and-coming players with notable achievements. They gave speeches, played simuls, blitz and rapid chess for the purpose of inspiring youth in Jamaica. Here are the some of the promotions that Qiyu Zhou did. Quota from the news report: “Woman Grandmaster and Canadian Women’s Champion, 17-year-old Qiyu Zhou said she wants to inspire the children of Jamaica to play chess and “start or continue to pursue whatever they want to achieve”. This entry was posted in Uncategorized on November 26, 2017 by qiyuzhou. This entry was posted in Uncategorized on May 19, 2017 by qiyuzhou. This entry was posted in Uncategorized on March 26, 2017 by qiyuzhou. 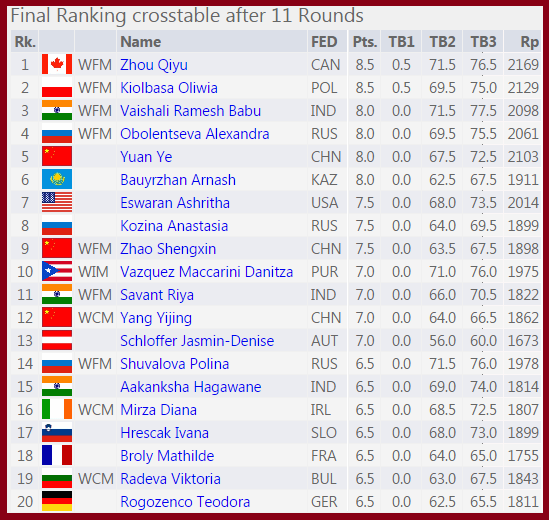 Qiyu Zhou played her first tournament in England after finishing her World Women’s Chess Championship in Tehran, Iran. She really enjoyed her play there thanks to the organizer’s hospitality and the fighting spirit of her opponents. Here is the result that she played in the 41st BLACKPOOL CHESS CONFERENCE, England from friday 10th – Sunday 12th March 2017, got 4/5 (didn’t make to the first round due to the traffic jam from the airport, and received a 1/2 bye), shared the 3rd place , and received the best junior and female Prize . Qiyu Zhou will play in these two upcoming international opens: Cappelle la Grande and Reykjavik Open 2015. These will be her first international opens. This entry was posted in Uncategorized on February 18, 2015 by qiyuzhou. Abstract: Origami is an educational tool of great value. A partial list of these benefits includes: visual sequential memory, ability to follow directions (visual or auditory), eye hand coordination, spatial perception, and fine motor skills. The child also develops associative thinking skills, improves patience, concentration, and attention to details. Most of all, it involves emotions, which can calm down the hype-active children and excite the bored ones in the class. This entry was posted in My thoughts on November 16, 2014 by qiyuzhou. Thank you , Mr. Watson, for your recognition. We wish that chess as a noble sport can get some financial support from the government. This entry was posted in Uncategorized on October 23, 2014 by qiyuzhou. 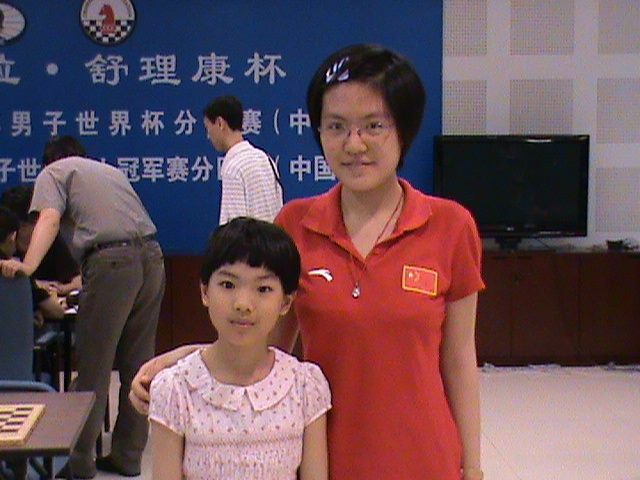 Qiyu Zhou at the age of 8, and Yifan Hou at the age of 14 (Qiyu’s current age) in the photo below , Qiyu was very lucky to meet her again and took a photo with her. Qiyu first met Yifan at the age of five when she was playing in U10G, WYCC 2005, Belfort, France. Yifan was around 11 years old, who was playing in U12 open section. Due to the big age difference, they could hardly talk to each other. But they did talk something back to 2005. Yifan is an extremely charming, humble, and talented girl, who has very pleasant personality. Qiyu is bit like her, very gentle , kind and caring in nature. But Yifan is much stronger than Qiyu in chess, and Qiyu can’t match her at this stage. When I first met and talked to Yifan in 2005, I knew that she would be an extraordinary chess player. It’s not a surprise when she became the Women’s World Chess Champion at the age of 18. I know that she is an incredible girl! Yifan enjoyed reading fictions so much, and I remembered that she was reading a novel whenever she got free time in WYCC ,2005. Maybe this is the reason she wore glasses at a young age. This entry was posted in Uncategorized on October 21, 2014 by qiyuzhou. This was a year like no other, largely due to the fact I achieved my early childhood dream: becoming a World Champion. 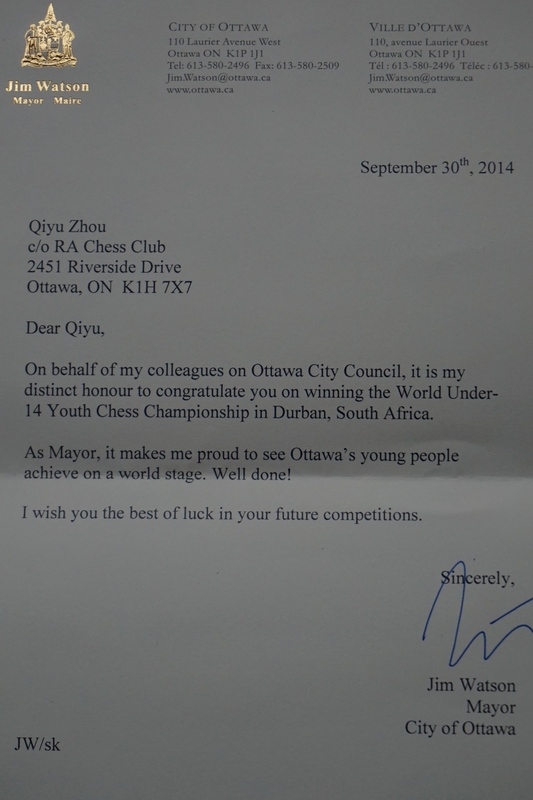 This would not have been possible without the support of the Chess Federation of Canada, which gave me the opportunity to represent Canada once again in the world, and without the support of my Canadian chess friends, who donated around $1,000 to my South Africa trip. Becoming a World Champion means a lot to me, and this has encouraged me to keep playing chess and to continue to improve. My goals for the future include playing the World Junior Chess Championship, and to continue to play on the Canadian Women’s Olympiad team. I intend to earn the WIM title as soon as possible, and then to get either the IM title or the WGM title soon after. I am proud to have won a gold medal for Canada, and I would like to thank all of you for the support. This entry was posted in Uncategorized on October 7, 2014 by qiyuzhou. 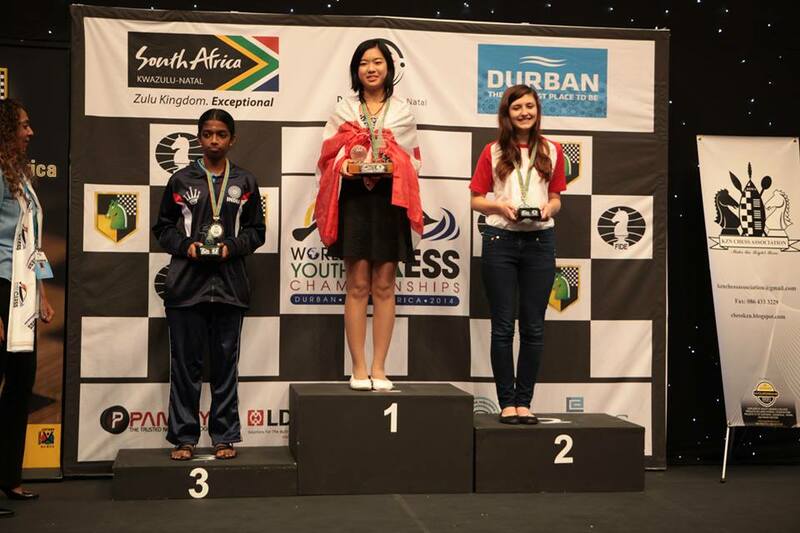 Qiyu Zhou won the World Youth Chess Championship for girls U14 in Durban, South Africa! She scored 8.5 out of 11, going undefeated (+6 =5 -0), leading the group from round 3. 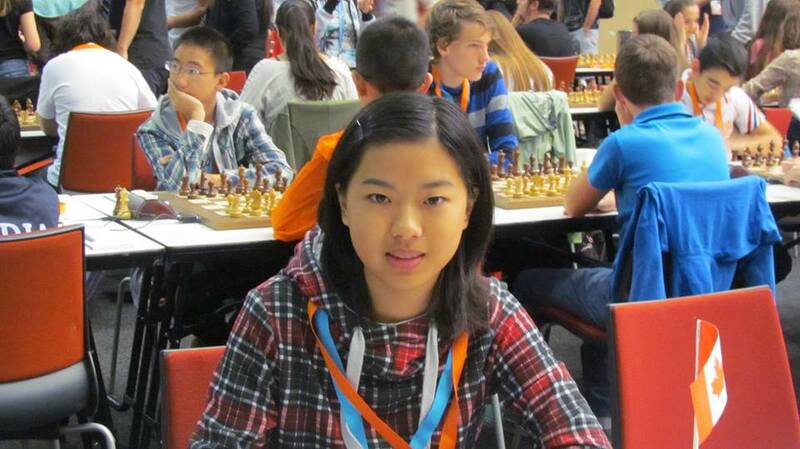 This is her first world youth chess champion representing Canada, but her second WYCC medal . 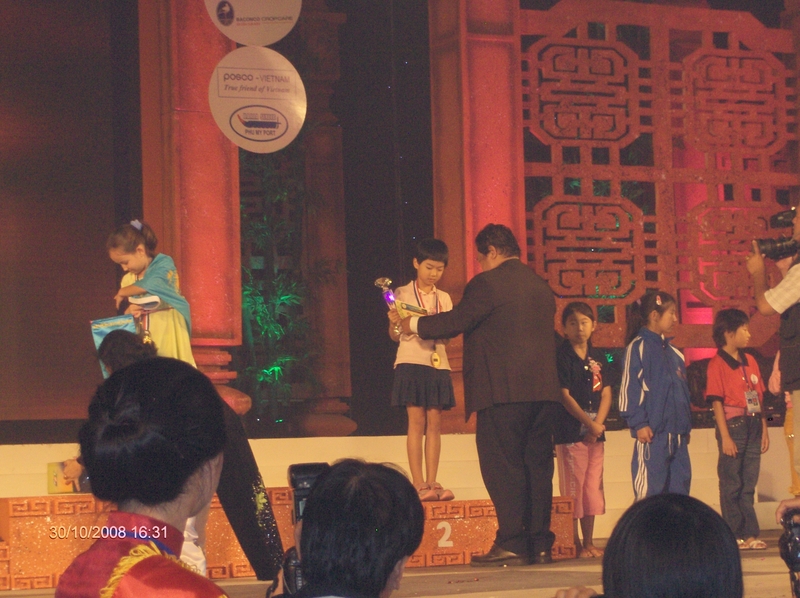 She won the silver medal in WYCC U8G in Vietnam 2008, scored 8.5 out of 11 as well. She has been several times top 10 in WYCC. This was her 4th time on the WYCC podium, because it awarded the top 6 in every WYCC. This is her photo on the podium in Durban, WYCC, 2014. 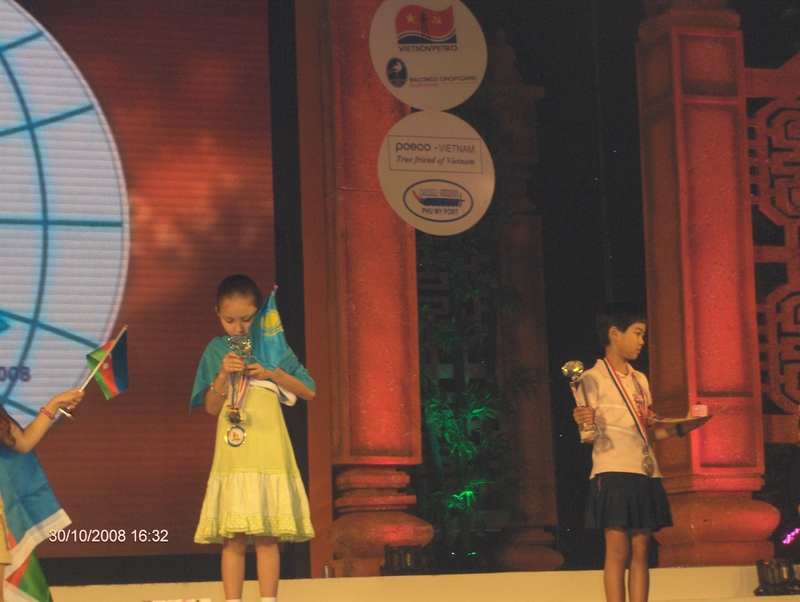 She looks like now when the game starts in WYCC 2014: This was how she looked like in 2008, WYCC, Vietnam . The similarity is that she immediately hurried to her schools and enjoyed time with her classes after she came back from the championships. Both her IB schools in Finland (Oulu International School ) and Colonel By Secondary School in Ottawa, Canada all threw her a big party. She received the warmest congratulations and support from her classmates and teachers alike. She all the time values friendship! She is very happy because one of her very early childhood dreams came into true. Below is her standing this year: Big thanks to everyone who helped her, unselfishly coached her, supported her, and encouraged her. Thanks for continuously following her chess quest and supporting her. This entry was posted in Uncategorized on October 3, 2014 by qiyuzhou. This entry was posted in Uncategorized, Videos on November 25, 2017 by qiyuzhou. This entry was posted in Uncategorized on February 14, 2016 by qiyuzhou. This entry was posted in Uncategorized on December 15, 2015 by qiyuzhou.